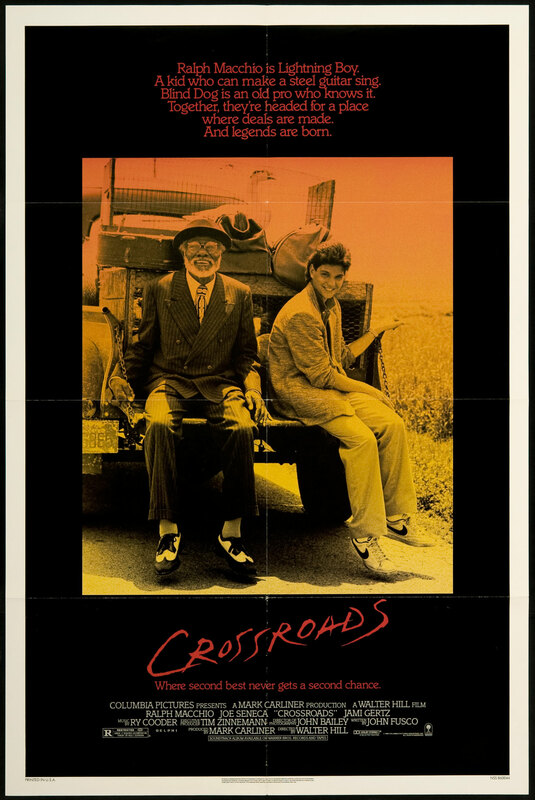 A wonderful 1986 Walter Hill film, Crossroads explores the relationship between a Julliard-trained college boy who loves the blues (Lightnin’ Boy, played by Ralph Macchio) and Willie Brown (played by Joe Seneca, who shared a birthday with yours truly). The plot is that Willie, like his friend and mentor, the blues legend Robert Johnson, sold his soul to the Devil– at a crossroads, of course– in order to be the best harp player in the world. Lightnin’ Boy will try to save Willie’s soul (and his own) by winning a haircutting guitar duel with the Devil’s guitar player, Jack Butler, played by the astonishing Steve Vai. Here’s the duel, which is actually played by Steve Vai with Ry Cooder playing Macchio’s part, or at least the bottleneck portion of it. I’ve heard so many conflicting stories about who played exactly what in this sequence that I don’t believe anyone except Cooder and Vai and maybe the film/sound editor knows for sure! Macchio’s hands are obviously sped up in the Peganini’s Caprice #24 section but he does a rather nice job of mimicking the actual hand positions. He was coached by Arlen Roth, who has a ton of great instructional materials available on many aspects of the guitar. The harp playing in this clip is by blues great Sonny Terry, whom I was lucky enough to meet in Tampa one night in 1972. Macchio’s “playing” a ’70s maple-necked Telecaster (either an American Standard or a Japanese Squier; no skunk-stripe on the back of the neck) in this, while Vai “plays” a red variant of his trademark Jackson whammy-barred specials. Most folks say Vai played his portion of the actual duel on his heavily customized “Green Meanie” Charvel guitar in the studio.